The Guest Cat is an odd little book. 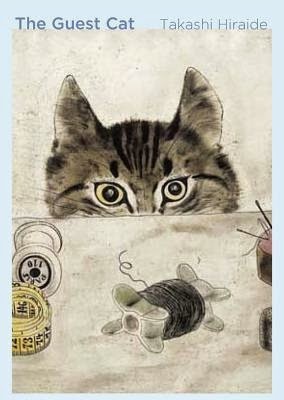 It is a fairly simple novella about a Tokyo couple who gradually become a second family to a neighbour's cat they call Chibi. Rather unfortunately, it feels as though something large has been lost in translation with this one. I'm loath to point the finger at the translator - not least because the last time I did that person wrote an Amazon review explaining how I'd read the book wrong - but this does read as though it's quite a literal translation. Another one of Chibi's characteristics was that she changed the direction of her cautious attention frequently. It's not constant by any means, and it doesn't render the book as unreadable as that isolated sentence suggests, but it's certainly a problem. Translating literary books demands rare skills anyway; translating from Japanese (which has so much particular vocabulary and a culture completely different from the West) ... well, I can't imagine it's easy. It also raises the question of what a translator should do - should they be extensively rewriting or merely reporting what is written? Who should decide if that sentence should be "Chibi found many things to be cautious about" or "Chibi rarely relaxed"? There is a difference between a poetic statement and one which is overwritten. I didn't feel the translation always got that right. When it's good it's delicate, stepping lightly through the simplicity of the tale, but when it's not it's that quote, or it's contradicting itself, or it's starting threads which are never returned to and generally leaving me slightly confused. There are some notes/footnotes from the translator which are illuminating enough for me to wish either they, or an expert in Japanese Literature, had written an introduction. I would feel the benefit of having this explained to me a bit. On a personal level, I found this a very interesting book. There are protracted descriptions of the house which I found fascinating but which others may well find tedious. The narrator's engagement with Chibi is the typical monologue of the cat enthusiast; the reader's mileage will vary according to their meatworld keeness for this. Although I'm giving this three stars I can't honestly say I'd recommend it. I'm in that weird situation where I'm reading other, more positive reviews, agreeing with them totally, but not actually making that connection myself. I do very much feel that it's me who hasn't got it, rather than there being nothing to get. There are certainly shades of something, but even with the benefit of a few days rumination, I couldn't actually tell you what.